Well… Let’s start with getting a “Game Plan”. Most businesses create a business plan. And reassess on a yearly basis. Yet most acting careers are run something like… get a headshot, take classes, get an agent, then…well…kinda hope for the best. For this year, I suggest you take an entirely new approach and really give yourself a chance for success. This is beyond goal setting, even though goal setting in vital in a career. This time I want you to seek out more of a map, or blueprint for getting to the next level. “Goal Setting” often gets a bad rap because many people set weak half-dreams on January 1st and get disappointed when they don’t come true a few weeks later. But there was very little structure in place to begin with. This year, you want to give yourself a fighting chance. Follow these simple steps to start the process. Take 5 minutes and write down all of the things you want to achieve in your long-term career. This can be big picture stuff. Pie in the sky. Dream career goals. Life time achievement type stuff. Think big. Do not edit yourself. From your lifetime goals…narrow it down. Pick your top goal for this year. One that really excites you. Just one goal that you can really make happen considering where you are currently at in your career today. The idea is not to just throw something up that sounds great IF someone hands it to you on a silver platter. You want to pick something that you are passionate about enough to work on this goal a little bit every day for the next year. If you are a film or theater actor at heart, then really think twice about setting a goal to get a national commercial this year…especially if commercials don’t really interest you. The film and commercial worlds are often very different with different people, disciplines, and skill sets. Yet many actors are made to believe that commercials are a quick way to make some easy money to support the “real” acting career. Many professional L.A. actors quickly realize after driving to about three commercial auditions in Santa Monica, that this is not usually the case. Focus on what you REALLY want. Instead of what others tell you that you are supposed to want. From your main “One Year Goal”, work backwards. 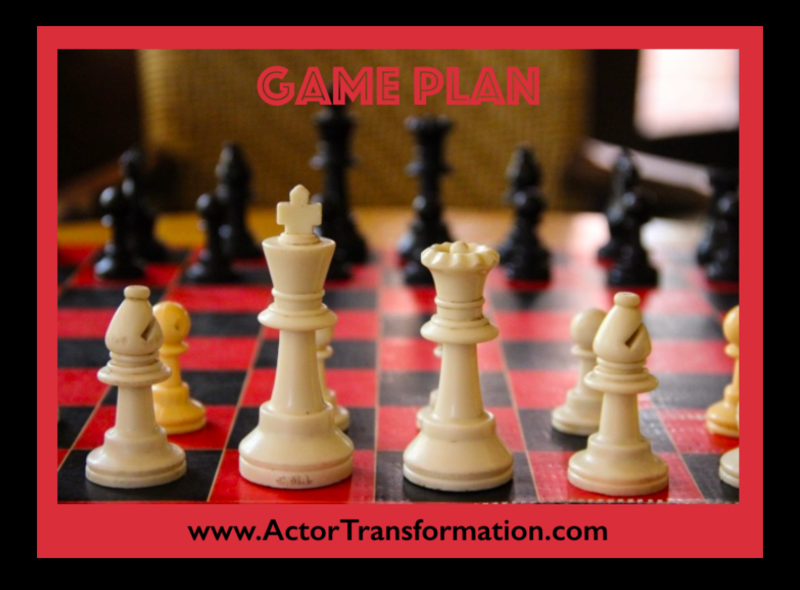 Meaning… If your 12 month goal is to book a lead role in a low budget, union feature film, yet you just moved to town and have never acted in a feature yet, then there will be many steps. 10 months – Getting 2 similar auditions per week – including call backs. This week – Audit 2 acting classes, set appointment with photographer, research agents, submit online. This is of course just a specific and simplified example. Your individual and detailed goal and actions might look very different. When you work backwards and break down each of your yearly goals, it should make it much more tangible and realistic. Remember … “People underestimate what they can accomplish in the long term and overestimate what they can achieve in the short term”. But when you break down your goals into bite-sized achievable action, you are giving yourself an opportunity to succeed. Please understand that you want to get in the habit of just taking the first step, and then another, and then another…you do not have to do it all right this second. In fact… you can’t. So build the habit of taking the first baby step….right now!